The Pasadena Symphony and POPS is one of California's most respected ensembles. Their year-round performances at the Ambassador Auditorium and LA Arboretum offer a truly unforgettable listening experience. Their winning formula is the perfect balance of talent, dedication to craft, and the thoughtful application of advanced audio technologies that Complete Production Rentals (CPR) knows intimately. 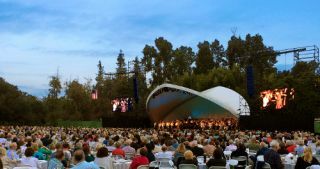 Based in nearby Westlake Village, CPR has been the symphony's exclusive audio provider for more than a decade, and CPR president and founder Jack Haffamier's relationship with the group dates back even further. It's a long-standing collaboration based on trust, and strengthened through many years of mutual success. With such a solid foundation, it's no surprise that Haffamier is ultra-critical of any new audio technology that seeks a place with the prestigious ensemble. Indeed this is all the more reason to appreciate his positive reaction to CPR's first official deployment of a VUE al-8 Line Array System for a recent performance in the LA Arboretum. "I first heard a selection of VUE speakers at a demo in Los Angeles late last year," explained Haffamier. "I was immediately impressed with their build quality and exceptional clarity-especially in the key vocal range. While I didn't get chance to hear the al-8 specifically on that day, I could tell immediately that there was a very consistent and compelling 'family voice' across the line." "I was very interested in testing the al-8 in real-world conditions," he said. "The LA Arboretum can be a challenging venue, and I was particularly concerned about getting adequate low- and mid-frequency coverage out to 280 feet." Front fill came courtesy of VUE h-12 and i-2x4.5 systems, while low frequency support was provided by eight VUE hs-28 ACM subwoofers. A pair of Midas PRO2 consoles handled the mix. Haffamier continued, "It wasn't just Larry and I who were impressed. Greg himself commented on how easy it was to keep the vocals in the heart of the mix without sacrificing intelligibility. That's a balance that most line arrays struggle with, but the VUE system achieved it effortlessly."